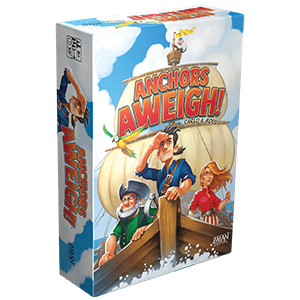 An ocean of adventure awaits you in Anchors Aweigh! Load your ship with everything you’ll need, then weigh anchor. Discover items, trade goods, and complete contracts to earn treasure. Grapple with fierce pirates, earning rewards if you defeat them. Will you earn the most treasure? Pre-order your copy of Anchors Aweigh from our website or your local retailer. The wind rushes, carrying the smell of salt water and ruffling your hair. The crew bustles around you, hauling up crates of supplies and organizing them in the cargo hold. You hear the crash of the waves against the side of the ship. The captain calls for the anchor to be hauled up. It’s time to set sail! Every adventure requires supplies. You’ll need everything from shovels and rope to a compass and sword. Prepare for your adventure by quickly grabbing tiles representing these pieces of equipment (known as assets), filling your ship’s cargo hold. The asset pile will be in the center of the table, within reach of all players. Adventure cards will be laid out around the assets. Each of the adventure cards will have requirements to complete it. You may need a piece of rope and a sailor to complete it, for example. When the round begins, players will quickly grab the asset tiles they need to complete the adventure cards. The first player to fill their ship calls out “Anchors aweigh!” and gathers the faceup adventure cards. The other players will have to fill the rest of their cargo holds from memory, hoping they grabbed the right supplies! Then it’s time to set sail. Another ship is spotted in the distance. The captain grabs the spyglass to see what approaches. The other ship is quickly catching up, sails billowing out with the wind. As the ship gets closer, her crew raises a flag. The wind catches the fabric, stretching it out to show the skull and crossbones emblazoned on the dark background. Pirates lurk on the high seas, hoping to catch sailors unaware and unprepared. As players continue their adventure, they will come across pirate cards. Each player can choose to fight or flee. If you choose to fight the pirates you must satisfy the supply requirements on the card or else you’ll pay a penalty. If you can satisfy the pirates you’ll reap the benefits, gaining treasure or valuable cargo items. As you sail across the ocean you’ll come across a few different adventure options to unload your supplies. 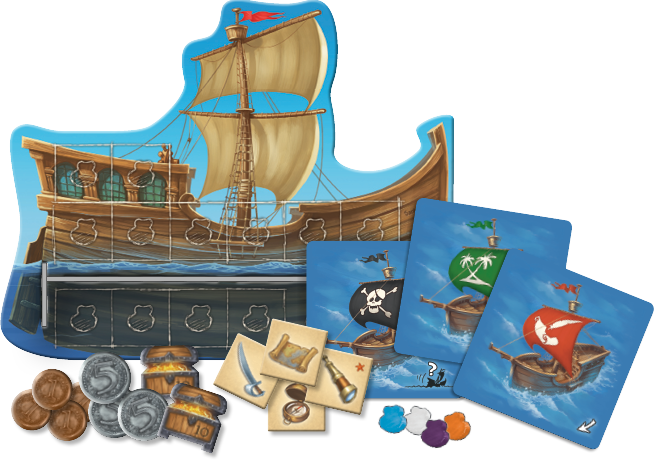 Discovery cards (the green sail) let players unload the supplies they stocked their ship with and gain cargo tokens instead. A rope and sailor tile could fulfill a Discovery card to earn you one orange, white, and blue cargo token, for example. 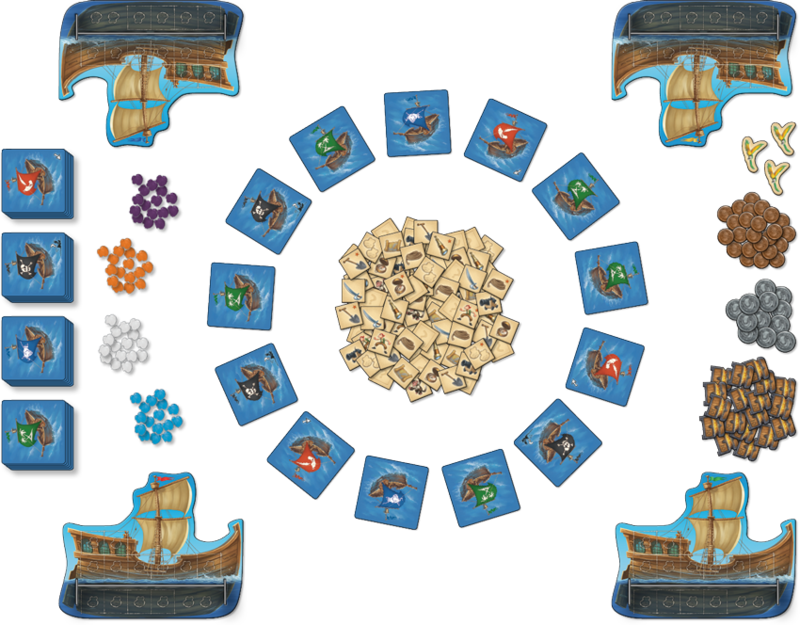 Trade cards (the blue sail) let players exchange cargo tokens, often gaining additional tokens or different colors. Finally, the Contract cards turn the valuable cargo into gold. 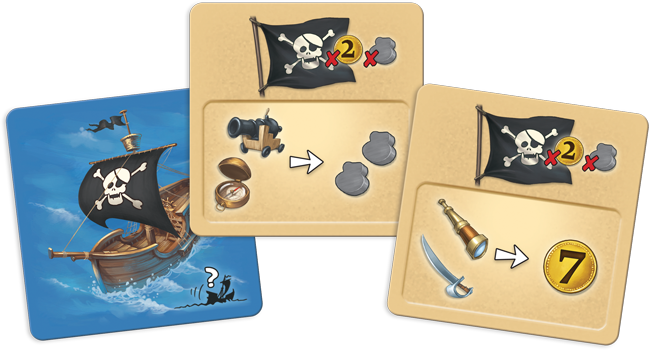 If you planned ahead at the beginning of the game, you’ll be able to complete multiple Discovery, Trade, and Contract cards, and hopefully fight off the pirates as well! After two rounds the player that earned the most treasure from their seafaring adventure will win. Will you earn the most treasure? 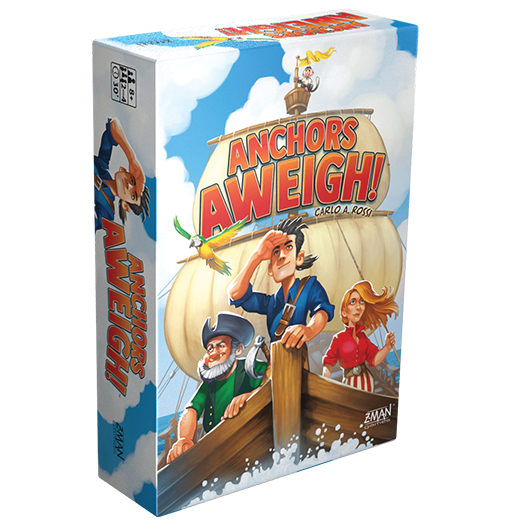 Pre-order your copy of Anchors Aweigh today and set sail!